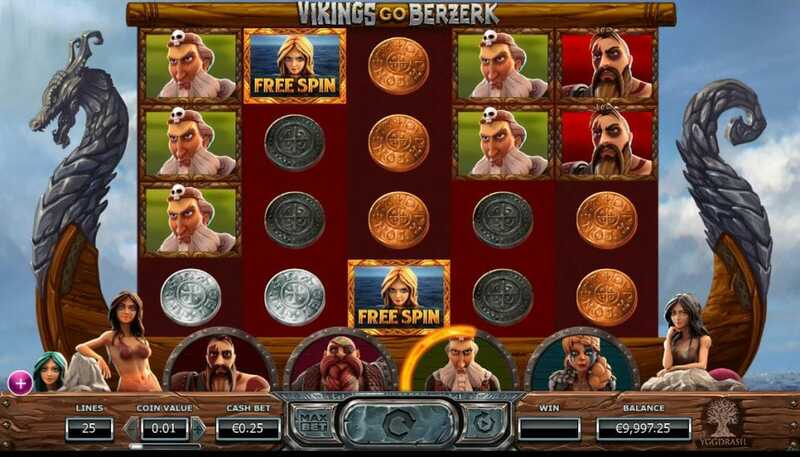 Vikings Go Bezerk is one of the superb new online slots game from Yggdrasil. What can we say about Vikings go Berzerk that maybe hasn’t been said already? Well for starters this is a great slot, one that possesses a very clear theme and runs with its variables despite having a few familiar modes and functions. This slot is greater than the sum of its parts so don’t think that what you see at face-value is the legitimate full experience. Vikings go Berzerk is a 5-reel game that boasts a different level of playability with every spin. 25 pay-lines will be the foundations for big cash payouts, this off-course depending on how well each player manipulates the board to harness their own potential. The more you play the more you will win, and the higher you bet the higher your pay-out, but hey we shouldn’t really need to tell you that. This is a lasting recent slot games that comes to you from the very successful developers Yggdrasil: people who know what they’re doing and will stop at nothing to give players what they want, and what they want is action and excitement — all of which can be found in Vikings go Berzerk. If you love promo's, get the top casino promotions today. Based in Malta, Yggdrasil is an online game dev company that was founded in 2013 by Fredrik Elmqvist. That name rings a bell? If not, then you might need to question why you don't know this person. Fredrik is the former NetEnt CEO which is a massive name in the online slot industry. Now lending his talents in a new environment, Frederick's vision to create new forms of entertainment has seemingly transcended into this new endeavour where the focus is still on player satisfaction with just a pinch of imagination in theme and gameplay: something he is notoriously known for. Ask any other developer and they will tell you that sparks of creativity cannot be just handed out, instead, they are earned through trial and error/years of harnessing a craft. Yggdrasil has only a few years under its belt, but it has managed to become more than a squiggle in a sea of quotients, it has become its own beast and one that will continue to wreak victorious havoc on the online game industry for many years to come. Believe us on that. Play Vikings go Berzerk Slot Online Now! Are you ready to unleash your inner Viking? What’s that, no you say? Well someone needs a slap. Time to wake up and realise the amazing online slot that is Vikings Go Berzerk, also sorry for the slap we were only trying to paint a picture into what it might be like if you happened to be in the presence of a Viking (they aren't known to be friendly so give us a break). To be a Viking would be to be the scourge of the oceans in search of treasures that shine, luckily for you, the Vikings here aren't going berserk to new recruits if anything these are quite laid back for being bezerk (berserk with a z for added emphasis). Now that we’ve got you hooked thanks to our amazing and well thought-out intro it’s time to talk about the game. You're going to experience many things in Vikings go Berzerk that’s for sure. First, you’ll feel humble, then loyalty as you work towards your element if anything you’ll be known as Kendrick the Viking when this is all said and done. Now as Kendrick the Viking you’ll be tasked with navigating the harsh waters that are seemingly against you in every way possible; these waves must really want to keep the gold to themselves. You should always be prepared for battle as you never know when you might be blind-sighted by something really opposed to you coming out victorious. Like many online slots in the market, Vikings Go Berzerk features many different bonus features that all offer different levels of gameplay depending on what you are looking for in your game. Expect free spins, wild and scatter symbols among other features. This is a 5 reel slot by 25 fixed pay-lines: allowing many chances for you to run the reels in search of the gold. The reels themselves sit atop a traditional Viking ship, with a rather majestic metallic dragon as serving as the ship's figurehead. The design, in general, is very well executed which works very well in creating that feeling of immersion that we always tend to go for. The drawn-out colours really mesh well with the rest of the design, this is almost clear from the outset when one first lays their eyes on this behemoth of a slot. Treasures are awarded to those who want it most so play, play with your hearts content and make sure that you bare the battle scars of this slot wherever you go, you want them to know the trials you have passed in order to reach the summit of this moment, for you have conquered Vikings go Bezerk. How many times can you say that you got the chance to become a Viking for the day? We’re guessing that it’s a very rare thing for you. But hey that’s no problem because with Vikings Go Berzerk you are taken to times of old but with the mentality of someone in the present day. Your reflexes must be as sharp as the slap we gave you in the introductory paragraph (sorry again) if you wish to succeed where so many have perished in Vikings Go Berzerk. If anything, you will be wearing the battle scars of previous spins as penance for your continued strides in wanting to succeed in defeating those high cash-pay-outs. Make no mistake about it, children will write songs about what happens here, they will sing about your continuous efforts to own the seas as your own despite the harsh conditions that may plague your assault to tame the beast. We could go on forever documenting your experience here — like a Viking David Attenborough — but we wouldn’t want to give too much away, Play Vikings Go Berzerk now if you wanna feel truly alive! 8/10 If you enjoyed Vikings Go Berzerk then you might also like Horsing About. Vikings Go Wild - Play this wild viking slot today, from the same developers, with gameplay that is equally as exciting. If not even more fun! Vikings Go to Hell - The sequel to the Viking Trilogy from Yggdrasil. You'll have hours of entertainment ahead of you playing this awesome online game.